well heres the deal: i had an amplifier lying around so i decided i wanted to amplify my factory speakers. since im running lines to the trunk already half the work is already done when i decide to put in a subwoofer. 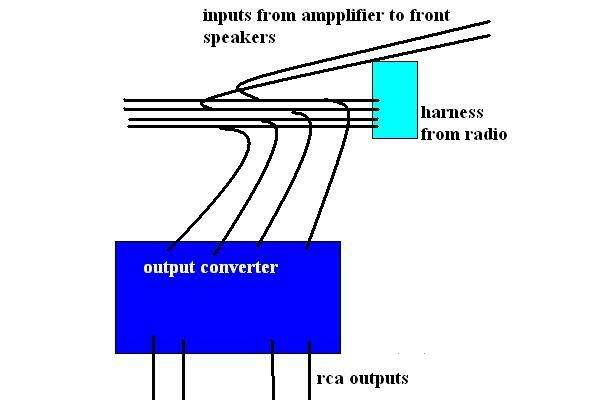 Im using my factoyr headunit so i needed rca outputs for my amplifier. i cut and spliced the wires i needed for the rca output converter behind the headunit onto the harness. when i put the headunit back on to test it the headunit turned on find and the amplifier is on but i got no sound. i tried turning up the gains on everything, volume to the max. all is quiet. i really dont know what i did wrong. i crimped the wires together so i might have to consider ripping the crimpers off and making a solid connection with solder. the reason i did the output converter behind the headunit is because ive watched an installer do it and it worked for him fine. but of course this is my first time doin it so i think i may have screwed myself over. do you think something happened to the radio itself? are your rca's good? is amp power light on oris amp going into protection? did amp work b4 install? what did you do for an amp turn-on? that +12V is needed to turn the amp on. what LOC did you buy? confirm that the front speakers are still powered by the head unit. that you did not cut the front speaker wires, just tapped them. I ran the remote wire to the radio fuse. The LOC i just soldered the speaker wire to some RCA plugss so i custom made it. I havent tested the door speakers yet just left it when my speakers cut out after i thought i was finished wiring my subs. I dont wanna pay someone to look at it because i want to learn. I have basic electrical/mechanical knowledge so im not a noob. HELP! is it better to have more torque or more horsepower?